For today’s skywatch I present two rainy day pictures from Malaysia. Of late I have developed a penchant to click pictures through car/bus windows when it is raining outside. That way sometimes I get interesting pictures! If you search for Sultan Abdul Samad Mosque, Sepang, Malaysia on the net, you will find that it is a well photographed mosque. 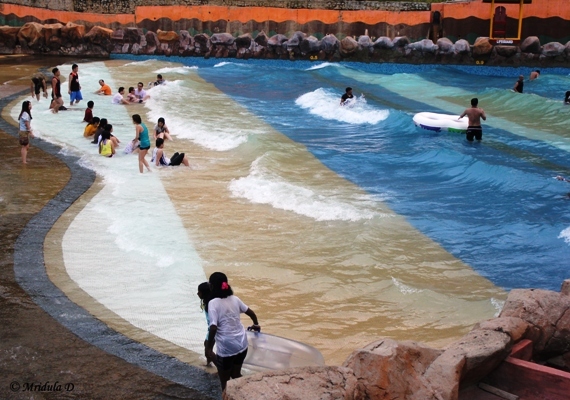 It is actually on the way from Kuala Lumpur International Airport to Kuala Lumpur City. You can see it from the highway and I am sure like me, a lot of tourists would react by clicking a picture and sharing it on the net! This picture was clicked on our way to the hotel in Putrajaya. 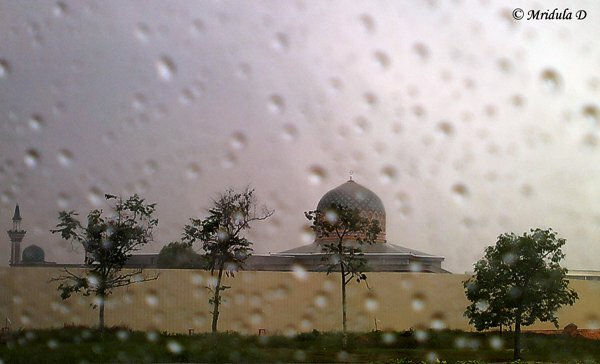 I had clicked the mosque on my previous visit to Kuala Lumpur as well but I find this picture more interesting because of the raindrops. 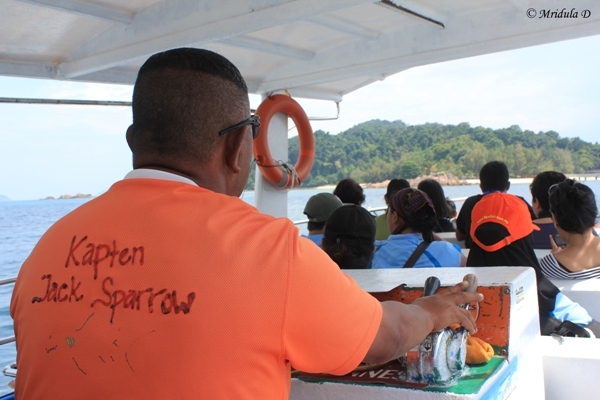 This picture also has a Sepang connection. 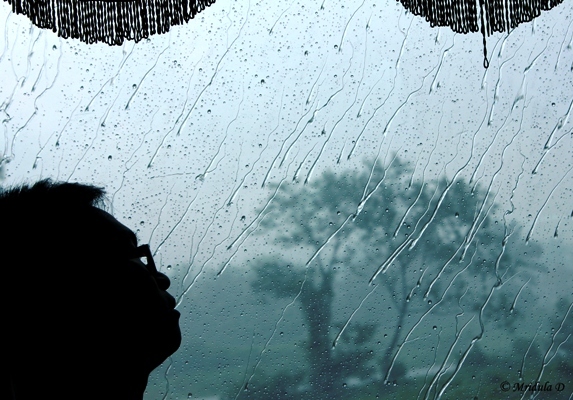 We were traveling to the Sepang F1 International Circuit when I spotted rain and a participant of the Malaysia Tourism Hunt 2012 by the window. And I thought they made a pretty picture! I otherwise do not like rainy days too much if I am looking to shoot pictures as the gery skies make it so difficult to take any decent pictures. But I now realize that shooting through the window of a vehicle with raindrops on it sometimes can save the day! I have to admit I am not much of a driver! 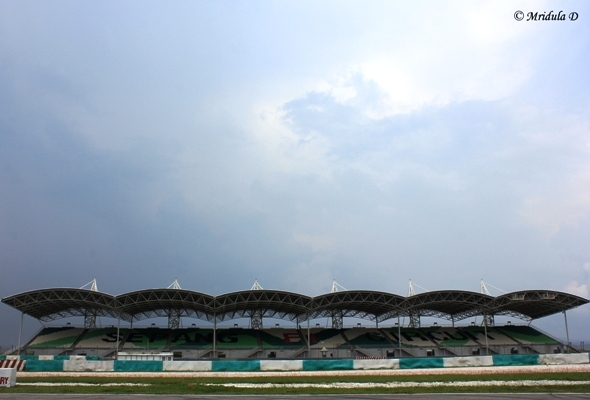 And yet I ended up driving (OK only at 80kmph) at the Sepang F1 International Circuit in Malaysia today. It was not intended but it still happened. 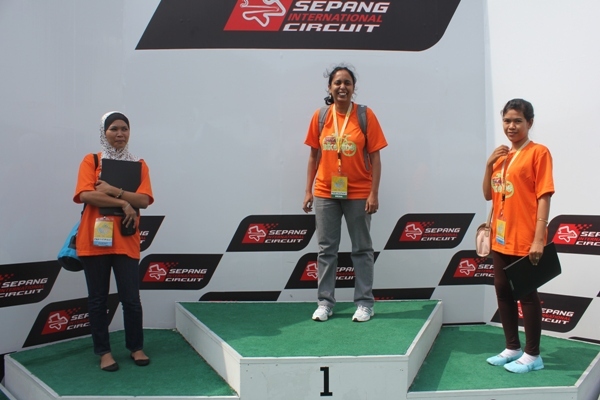 We all as the part of our Tourism Hunt 2012 were invited to the Sepang International F1 Circuit!. Suzi was our driver and I was not keen on driving as I am not much into cars! But I was so excited to be a part of the atmosphere and click pictures! And then our flag off started and Suzi zoomed in our Proton Persona with 3 of us doing pillion riding. I had a gala time clicking pictures of the track. One of the best views is of the grand stand. And I have to say the pre flag off briefing was very interesting in itself. The F1 track officials gave us a stern warning about wearing our seat belts, not using the phone while driving and not stopping for any pictures, so some pictures are from the zooming car. Now allow me to take a slight detour here. Before coming to Malaysia I had planned a trip to Jaipur to experience the Double Decker train. But I had to cancel that trip because my sister and niece got ill. And my sister owns an automatic car. And since she was ill she insisted that I drive her automatic so that in future if need be I would be able to handle the car myself. I otherwise avoid driving as much as I can but this was one occasion when I forced myself to drive and that is the only time I drove an automatic. Let me now fast forward to Sepang F1 International Circuit. As every car had more than one driver we made a pit stop so that we could exchange drivers. I still had no plans to drive. But both the drivers in my car went for a washroom break and when the time came to drive off again they were nowhere in site. So the organizers asked me and Aidil if we would drive? Aidil flatly refused and that left me with a F1 track and a car and I could not refuse! Thank god I had driven an automatic before or I could have never taken the initiative! 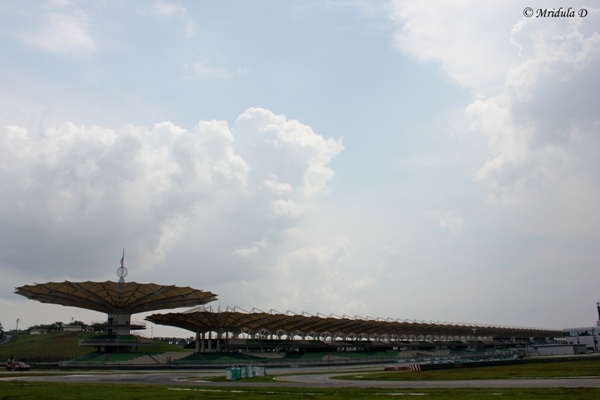 So I took the car and drove around the Sepang F1 International Circuit twice! It has been a thrilling experience indeed! So what if I drove at 80 KMPH! Then we went around the ‘behind the scene’ tour of the race course. I got to hear that the F1 track is booked every single day for events! 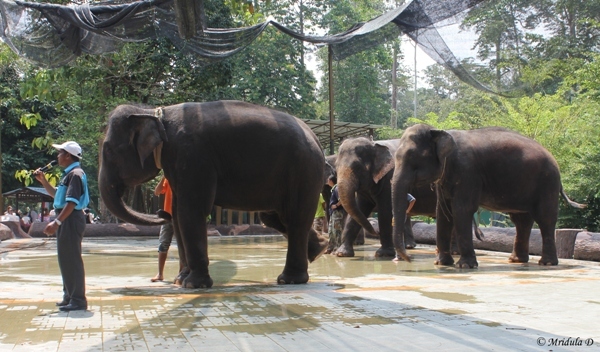 It could be a corporate booking, an event like the one we experienced, a wedding (can you believe that? ), car testing, tire testing and a lot more. We were shown the room reserved for the King and the Prime Minister to watch the F1 race. I do Silly Things Sometimes! And when it came for time to be silly, I took that opportunity too! 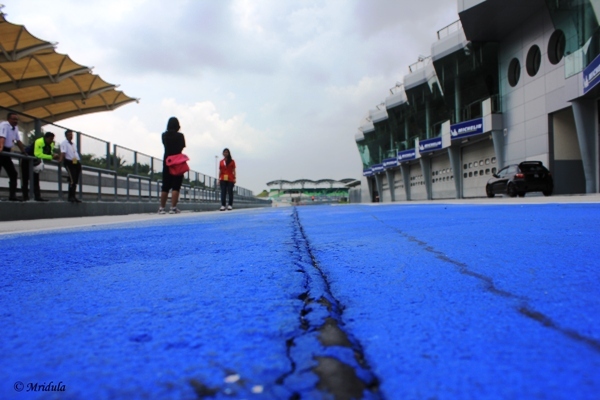 Sepang F1 International Circuit does tourist tours at the race course. 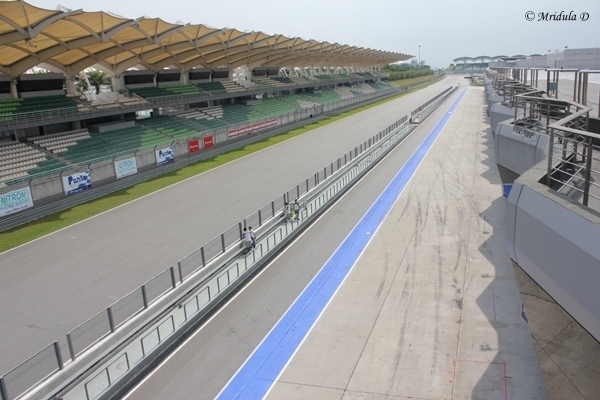 They are also going to hold the MotoGP next month for which the Malaysian participant was using the track going around zip zap zoom while we were there! And if one motorcycle can make that noise I wonder how it would be when the race would be on!